If you have any questions or want to enquire about dates, use our form to contact Hilary & Tim Collins or see their website for more information. Old Red Lion is a treat. This Georgian house is in the middle of the thriving town – on a quiet lane through an archway just off Market Place. The wide, blue front door looks instantly inviting… step in to a friendly place, awash with warm colours, art, market finds and funny little nooks and crannies. There’s plenty of space, and Hilary and Tim have created an easy home you can share with friends and family (their own boys love it here!). 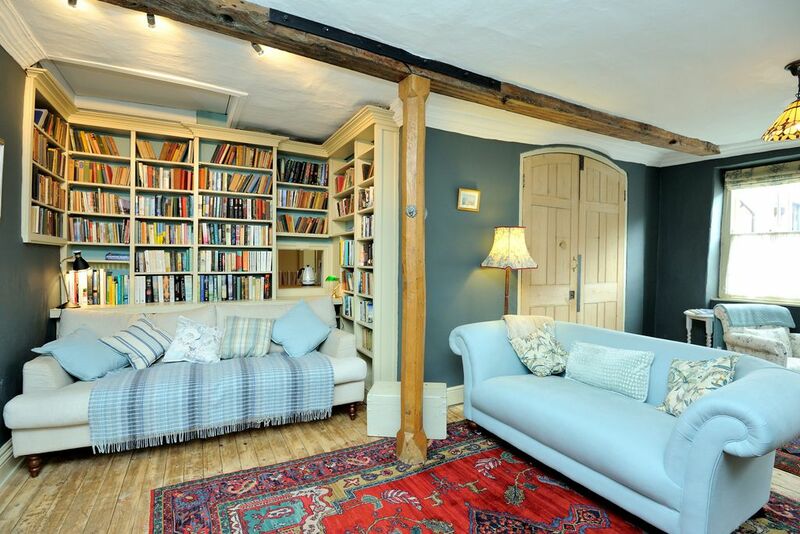 Downstairs there’s a big sitting room with wood-burner, books, comfy sofas, colourful rugs. This opens out to a sociable dining area with old pine table and masses of cushions on benches; the kitchen has a two-oven stove, coffee machine and all you need to cook for a hungry hoard. Stone steps lead up to another elegantly furnished sitting room – a lovely spot to chat or read. Pretty bedrooms have well-dressed beds: two on the first floor and two up more stairs at the top of the house – each floor has a shared bathroom. Your garden is at the end of the lane: a sheltered patch with a shed for bikes – snoozes in the sun, snifters before dinner – and you can spot otters and kingfishers on a stunning river walk. Special offer: The weekend from 17th May is still available so as a last minute offer we are reducing the price to £495 for the weekend. Call or text Hilary on 07812162548 and quote Sawdays to redeem this offer. Old Red Lion is indeed a treat. It’s a wonderfully warm and enveloping space which feels welcoming the minute you cross the threshold. As others have commented, the house easily accommodates eight (in our case consisting of three generations) and the proximity of shops, cafés etc makes catering very easy. Blandford Forum is an excellent centre for exploring all Dorset has to offer but if the weather is inclement, the house is home to some 1,000 books - just browsing the shelves is a delight. Eight of us stayed at Hilary's place for a relaxing weekend in October. The location was perfect - seconds away from local shops and pubs... It was also very close to the local countryside and a selection of villages beyond. Hilary herself was the perfect host. The house was perfect and we made great use of the wood burning stove. The kitchen was well stocked and there was enough room for all eight of us to eat together at the dining room table. 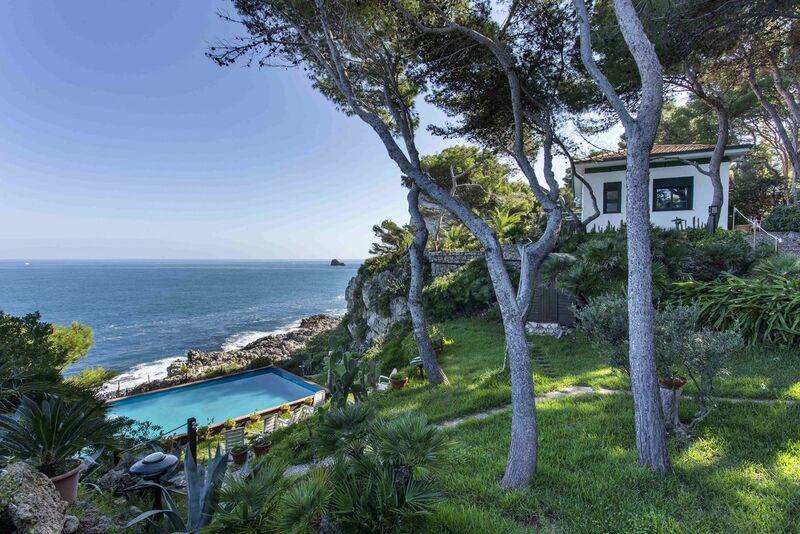 Hilary has a beautiful house in a wonderful location and we will definitely be looking into coming back. Lovely house, beautifully decorated throughout. Beds and pillows were comfortable. The wood burner came into its own in the evenings. Despite being near the church the bells did not keep us awake during the night but could disturb light sleepers. The Old Red Lion was the perfect place to celebrate our birthdays across three generations. The well proportioned spaces meant there was room for our guests, and having such a great selection of shops on our doorstep and the well equipped kitchen made shopping and catering for large numbers a breeze. Hilary was brilliant and went out of her way to be helpful and accommodating. We had a great week and would highly recommend. Lovely stay at The Red Lion. Accommodation had everything that we required. Excellent position with shops bars restaurants and farmers market all within walking distance. Thoroughly enjoyed our stay there and thank you Hilary for your kind hospitality. We all had a fabulous stay at Old Red Lion House! It's a beautiful house, a real home from home. We loved the fact we were so close to shops, restaurants and lovely walks, as well as being just a short drive from the coast. Would highly recommend and would definitely look to stay again! Such a lovely home with all sorts of surprises! We absolutely loved Old Red Lion. Very quaint, clean, perfect location, adorable town and incredible hostess. Hilary kept me informed of various places to visit gave excellent instructions and communicated numerous times once our reservations were in place. The house is beautifully decorated and such a cozy place to relax after a long day of sightseeing. Everything you need is provided in the kitchen and a quick walk to Morrison's will find needed groceries. We will definitely reserve again on our return trip to England! Lovely cosy house, beautifully decorated and in a great location for walks, shops and restaurants. 3 lovely areas to sit in the house, if you don't want to all sit together, or can easily fit in 8 people without being on top of each other. I would definitely recommend to friends and family. It was a real treat to stay in such a beautifully tasteful, yet cosy and comfy home from home. Every comfort had been thought of from the books and games, to the use of space for families. It was also great to be in the middle of town but down a quiet side street, the best of both worlds. We said we must go again! Can't wait to go beer tasting at the local brewery. Just the ideal place. we were two couples looking for a comfortable getaway. The house is larger than the pictures indicate, was warm, plenty of logs for the wood burner. We loved the good sized kitchen. We are foodies and normally go out but here we decided to stay in, cook our own dinner, snuggle down in front of the fire and watch some great films. Very quiet given it is town based and extremely comfortable beds. We will be back! The peaceful River Stour and lovely countryside walks are within a short distance from the house or if you're feeling energetic you can cycle along one of the trailways to one of the nearby pretty villages to enjoy a hard earned drink. There are some great places to visit in Blandford Forum itself including the Fashion Museum, the charming Blandford Town Museum and its Victorian garden, and the Hall & Woodhouse brewery offers regular tours. All are just a short walk from the house. With your stay at Old Red Lion you are spoilt for choice if you like eating out. Your hardest decision will be where to go; from pubs, restaurants and superb coffee shops, there is a great choice of places to dine and drink minutes from the house. Market Place, in the centre of Blandford Forum, hosts the local market every Thursday and Saturday with stalls, and the Georgian town hall, opening to sell food, clothing and handmade goods. Blandford Forum offers easy access to all the fabulous things that Dorset has to offer, with Cranborne Chase Area of Outstanding Beauty just to the north and local towns such as Wimbourne, Dorchester and Salisbury a short drive away. Alternatively travel south to enjoy Dorset's magnificent coastline with the natural harbour of Lulworth Cove, the stretching beaches of Studland, or the vibrancy of Poole harbour within easy reach for lazy summer ice creams or bracing winter walks.